Combine 3 1/2 cups berries with the sugar and flour. Spoon the mixture into an unbaked pie shell. 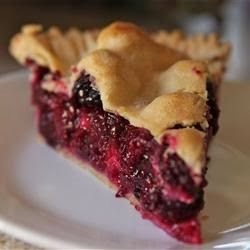 Spread the remaining 1/2 cup berries on top of the sweetened berries, and cover with the top crust. Seal and crimp the edges, and cut vents in the top crust for steam to escape. Brush the top crust with milk, and sprinkle with 1/4 cup sugar. Bake in the preheated oven for 15 minutes. Reduce the temperature of the oven to 375 degrees F (190 degrees C), and bake for an additional 20 to 25 minutes, or until the filling is bubbly and the crust is golden brown. Cool on wire rack.